Granville Island Brewing has brought out a new Summer Seasonal beer in 6 packs. 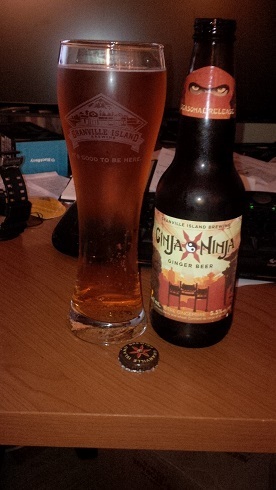 The “Ginja Ninja” Ginger Beer is a reimaganing of the Limited Release of the Ginger Beer. The limited release was an ale but this release is a lager. To differentiate this seasonal brew with the regular fare from Granville Island Brewing they have started a new branding for the seasonal beers. The beer pours a golden colour with a small off white head. The aroma consists of malts but mostly ginger. The flavour is of ginger, malts, a fruitiness and mild spice and sweetness. There is very little hops flavour to this brew but it is very crisp. The alcohol content of the brew is 5.5%. Yes this beer is not brewed at the Granville Island Brewery on Granville Island but Vern (brewmaster of limited releases) was heavily involved and it is a great tasting summer beer to be enjoyed on a patio near you! Commercial Description: Legend speaks of a ninja rising from the shores of the West Coast. The Ninja was said to be bold and Versatile with a sneaky kick. And the Ninja’s thirst for vengeance was matched only by a thirst for the refreshing taste of a true ginger beer. My food pairing recommendation: eat this brew with some great Sushi! Who does not like ginger with sushi? This entry was posted in Ginger Beer, Lager and tagged bc, beer, canada, crisp, fruit, fruitiness, fruity, ginger, ginger beer, ginger lager, granville island, granville island brewing, lager, malt, malts, malty, mild spice, mild spicy, mild sweet, seasonal, spice, spicy, summer seasonal, sweet, vancouver. It needs to be served ice cold, is quite refreshing, but I think I might have preferred a tad more hops. A better ginger flavour than a few other “ginger beers” that I have tried, but not nearly as strong in the ginger department as a Caribbean brand I can not really recall at this time.. If this had been brewed on the island instead of at Molson then it would have been more polished. That way Vern would have complete control over the recipe and brewing. It is a good summer lager go be enjoyed cold on a patio somewhere for sure!